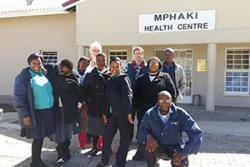 An earlier visit to meet project partners at Mphaki Health Centre, Lesotho. Bangor University’s School of Healthcare Science will be sending key academics with expertise in healthcare organisation, management and leadership to Lesotho. The University is working with Betsi Cadwaladr University Health Board (BCUHB) on a Department for International Development funded project awarded via the Tropical Health & Education Trust Health Partnership (THET) Scheme. The 20 month project will see the University and Health Board working in partnership with health colleagues in Quthing, Lesotho in Sothern Africa. Bangor University’s School of Healthcare Sciences will be providing bespoke refresher training in clinical skills at remote health centres and to support health management at a district level. This will be delivered using a sustainable ‘train the trainer’ model so that the benefits can continue beyond the project life. “I am delighted that this project will enable the expertise and experience of staff from the School of Healthcare Sciences to contribute to the development of nursing services in Lesotho. This project will address important health challenges in southern Africa, and is an excellent example of how the School and colleagues from BCUHB can collaborate with international partners to improve health across the world”. 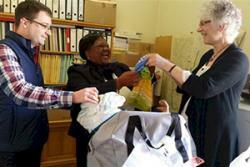 BCUHB has a longstanding link with their partners in Lesotho and will be sending health workers with primary care and clinical assessment skills as part of the project, which will also see the Welsh team benefitting from seeing how common challenges, such as how healthcare is delivered in rural Lesotho, are addressed. With a shortage of 4.25 million health workers around the world, the growing gap between the supply of appropriately trained health workers and the demand for their services is a key issue for underdevelopment and poverty worldwide.